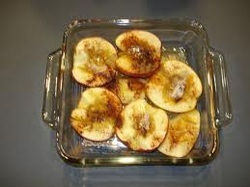 Baked Apples--a simply fabulous dessert when the apples begin to ripen in the cooler fall weather. Preheat oven to 350 degrees. Place apples core side up in a pyrex baking dish that just fits them. Add the water to the bottom of the baking dish. Top each of them with 1/2 T of butter, 1/2 t cinnamon, 1/2 t cloves and 1 t of sugar. Cover tightly with the aluminum foil. Bake covered for one hour. Healthy & Delicious. 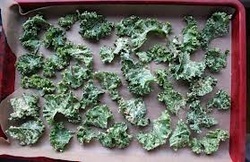 Kale Chips (aka Crispy Greens) - Everyone loves kale chips and they are soooo easy to make. Did you know you can make chips from most any garden green? Preheat oven to 350 degrees. Wash the greens and dry thoroughly in a salad spinner, with paper towels or just air dry. On a cutting board, use a kitchen knife to chop the kale (or other greens) into bite-sized (about 1″) pieces. (You can also tear greens apart with your hands.) Place dry greens in a large bowl, and drizzle with olive oil. Then using your hands, toss the greens/kale until the leaves are evenly coated with the oil. Lay the kale pieces out evenly on a greased or parchment-lined baking sheet, and then sprinkle with sea salt. Bake for about 12 minutes, or until greens/kale is dark green and crunchy. (Be careful not to burn greens once they have dried out.) Remove from oven, let cool, and then serve. See how easy that was! Eggplant Casserole - This is a favorite way to use up a few eggplants that need to get cooked. Quick, easy and delicious and only 1 baking pan for the whole process. You will need 3-5 average sized Eggplants, juice of 1 lemon, chopped or crushed garlic to taste or garlic salt may be substituted, 5T. Olive Oil, Qt. Stewed Tomatoes (home canned is best) 2 cups of shredded Italian type cheese like provolone or mozzarella. Use a large baking 10x15 baking pan and drizzle with olive oil, half the lemon juice and garlic to taste. Mix and spread in pan. Cut eggplant in half lenghways and place cut side down in baking pan. Bake at 350 for approx 1 hour or until knife will easily pierce through eggplants. Remove from oven and allow to cool. Scoop eggplant from skin and cut into bite sized pieces. Return to baking pan and mix with 1 QT or two cans of stewed tomatoes, 2 cups of grated cheese and stir well with remaining lemon juice and bake at 350 for approx 45 mins.